This week's episode highlights one of mankind's age-old battles: magicians vs. spiritualists. Spiritualists, fortune-tellers, tarot card readers, mind-readers claim to have super powers. Magicians, on the other hand, call bullsh*t, for they know how all the tricks work. The Spiritualist movement started in 1848 with the Fox sisters in Hydesville, New York. Little did the sisters know that they would be spawning an entire religious movement. It began with the sisters inviting a neighbor over to witness a series of strange phenomena that they were hearing every evening. While the sisters sat on their bed, the mother of the girls, Margaret, commanded the room to answer with five signs ... and there were five distinct thuds. Then she asked for fifteen, and sure enough fifteen raps were heard. Last she posed, “If you are an injured spirit manifest it by three raps.” And lo and behold: rap, rap, rap. This set off an obsession with Medium-ism, mostly because Rochester, New York (my home town!) was an epicenter for new religions like Mormonism (founded in Wayne County). Kate and Maggie took their rapping acts on tour around the East Coast and Midwest, while Leah stayed in New York and conducted seances. And who knows these tricks better than magicians? Illusionists like John Nevil Maskelyne and Harry Houdini weren't having any of the spiritualist movement. They testified in court that spiritualists were frauds, preying on people's emotions. 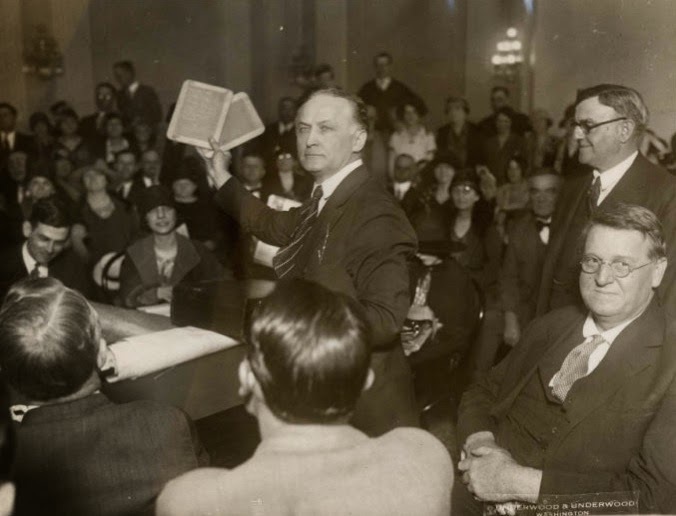 Here's a photo of Harry Houdini testifying before Congress in 1926 to have spiritualism banned from Washington D.C. And until recently, magician James Randi offered a million dollars to anyone who could prove existence of the supernatural. In this week's episode the Deception group uses their skills of manipulation to convince a deadly arms dealer that there is order in the chaos, that there are auspicious signals in the noise. In addition to some fancy neural-linguistic programming, the team needs to pull off a switch of the villain's mahjong tiles bag. And for that, they make what we call a "hold out." 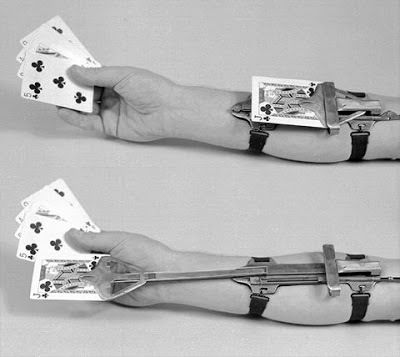 A hold out is a gambling apparatus that can deliver cards into a player's hands. Here are a couple of photos. Our version required a pulley system that would lower one bag onto the table and pull up the other. To the left are some test videos that Francis and I put together. 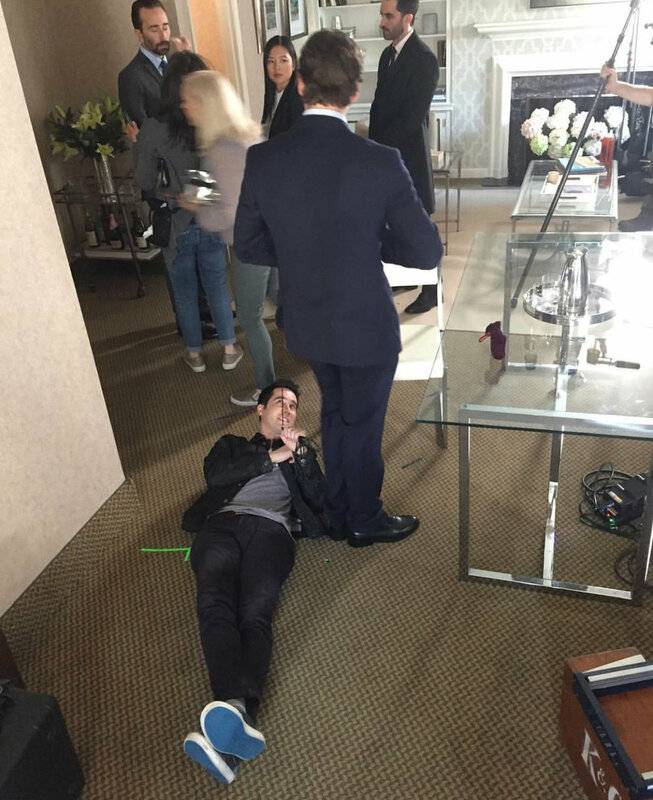 And to the right is a photo of me offering a little off-camera assistance. Last, I leave you with a cool test video of Francis performing the "penny to clover to rabbit's foot" trick that Cameron performs in the archive. Jack Cutmore-Scott executed this brilliantly with no cheats! We decided to call episode 3 "Escapology," which is the art of escaping from restraints (or in Cameron's case delicate situations as well). And of course, no one is more famous than the Handcuff King himself, Harry Houdini. I'll give you a brief description of who Harry and then we'll get to the Art Gallery mirrors. For the most thorough research on Houdini, I suggest visiting John Cox's blog Wild About Houdini. 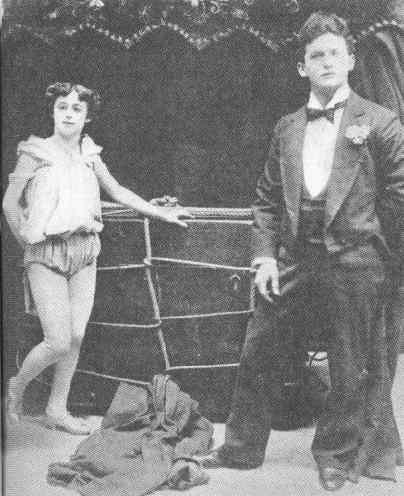 Houdini was born Erik Weisz in Budapest in 1874. His family immigrated to the United States four years later and settled in Appleton, Wisconsin, where his father, a rabbi, held a congregation. When Ehrich took up magic, he decided to call himself Houdini, an homage to Robert-Houdin, whom magicians refer to as the "founding father of modern magic." The great French conjurer, was responsible for making magic a respectable evening performance. Patrons would don their white tie and tails and gowns and attend Robert-Houdin's spectacles in his theater. Before this, magic was a "juggling" act, performed by street practitioners and court jesters. And so, Weiss added an "i" to Houdin, to be "like Houdini." 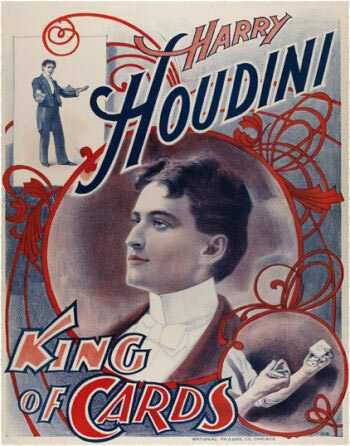 Houdini actually started is career as a manipulator of playing cards. Above is a poster from the early years. In 1893, Harry met Beatrice "Bess" Rahner, whom he married a year later. For his entire career Bess would be his stage assistant. The photo on the right is of their "metamorphosis act." 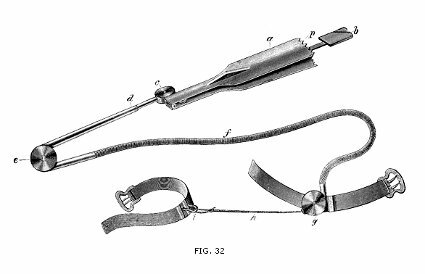 Metamorphosis, or the sub trunk, is credited to John Nevil Maskelyne, who invented it in the 1860's. Below is a video of the Pendragon's performing the sub trunk in record speed. If I could give out an Oscar for magic design, it would go to Francis Menotti for his work on the mirror illusions in this episode. There were two tricks: the "Moving Floor" and the "Von Liebig," both terms conjured up by the episode's writer Elizabeth Peterson. The moving floor was based on the simple principle of reflecting the floor surface so that one cannot tell where floor ends and mirror begins. Francis used a floor design with enough noise so that the reflection doesn't give away a mismatch of pattern. Now, can a perfectly reflecting mirror really be so bendable it can be rolled up? Better ask Gunther about that. Below is a behind the look at the moving floor illusion as we were filming it. For the von Liebig, we decided to base this scene on an old illusion, called the Blue Room. I can't go into the specifics of its design, but you can enjoy the mystery here. In order to pull this off, Francis created scale models of the Art Gallery. The hole represents what the camera sees: the 45 degree angle reflects the duplicate chamber to the right. The result? See below. This week’s Deception culminated in a couple of key deceptions that enabled the Magic Team to pull off the impossible. First, let’s address the term “forced perspective.” This is the idea that if you’re standing in a location determined by the illusionist, you will see what he or she wants you to see. For the most part, magic on television is the ultimate exercise in forced perspective. You, the audience, are viewing the action from one angle, the “frame” of the camera. Think of it like watching a play through the proscenium of the stage. There are some wonderful “anamorphic illusions” that rely on the viewer standing in a specific location. Here’s one. And this Honda commercial is cool. But above all, enjoy OK Go’s colorful foray into perspective illusions. For this episode, we decided to expand the notion of forced perspective to encompass a cognitive illusion as well. The Magic Team engineers an illusion that works “just enough,” allowing Mikhail's brain to complete the rest of the picture. They show him a few walls of a hospital, and a few key medical pieces to allow him to imagine the rest of the scene. Scientists call this process “amodal completion.” The best example is Kanizsa’s triangle (left). You only see parts of a figure but your brain completes the picture of a whole triangle. Your brain lies to you. What can I say? The other duplicitous move the Magic Team executes is a body switch for Cameron. Magic consultant Francis Menotti and I wanted to base this on a classic illusion called the De Kolta Chair. Buatier De Kolta was French magician born in 1845. He was known for his Spring Flowers, Multiplying Balls and Vanishing Bird Cage, all of which are still performed today. But his most famous illusion was the disappearance of a lady seated in a high-backed chair. De Kolta’s trick was so well-regarded that pioneering filmmaker Georges Méliès reproduced the effect in his 1896 film The Vanishing Lady or Escamotage d'une dame chez Robert-Houdin. 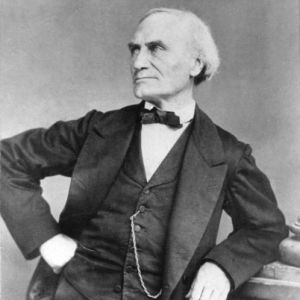 Méliès was of a magician, of course, and had taken up residency in the Théâtre Robert-Houdin (Robert-Houdin is largely considered the founding father of modern magic and is where Harry Houdini gets his name). Below is Méliès’s film. Note that he doesn’t need a trapdoor to vanish the woman (which is how De Kolta accomplished the feat). He instead makes use of a “substitution splice” the first documented use of the filmmaking effect. There's a long history of filmmakers as magicians. Why? Because they determine what you see (and how you feel) but controlling your perspective. Ladies and gentlemen, welcome! Each week I'll post behind the scenes information on how Deception comes together: the science and history behind the magic and the process of integrating illusions into television. First up, one of my favorite moments from the pilot: the person switch behind the painting. We get to see the whole Magic Team in action! This was inspired by the "Door Experiment" by renowned psychologists Daniel Simons and Daniel Levin (see video below). Magicians are master manipulators of your attention: Derren Brown has used the Door Experiment to great effect in his specials in the UK; Richard Wiseman, a professor of psychology at the University of Hertfordshire, often tests your attention in his Quirkology videos; and pickpocket Apollo Robbins masterfully challenges your perception in Brain Games. In the pilot, Cameron Black narrowly escapes from Prince's goons by driving blindfolded. Here's the history of the man behind that effect, Washington Irving Bishop. Bishop is credited with originating the Blindfold Drive when he managed to navigate a horse-drawn carriage while blindfolded in 1885. The first person to do the feat, however, was an English stone mason, Dennis Hendrick, who performed a blindfolded walk in 1820. And it wasn't until Dunninger in 1917 that a magician would use a car for the Blindfold Drive. 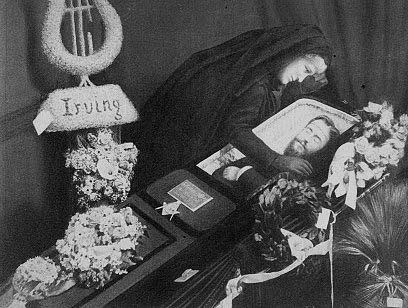 Born in 1856, Bishop launched his career by exposing the methods of Ann Eva Fay, a psychic medium, whom he managed. But as Bishop's career gained traction, he decided it was more effective to adopt the same approach, and pretend that he possessed extra-sensory abilities. Bishop was most known for a mentalism feat called Muscle Reading, which he learned from mind-reader Jacob Randall Brown. Bishop would blindfold himself and grab the hand of an audience volunteer. Despite not being able to see, Bishop was able to find hidden objects in the room by asking questions and sensing the involuntary ideomotor responses in the subject's hand. But it's Bishop's death that is perhaps the most interesting. On May 12, 1889, Bishop was performing at the Lambs' Club in New York City when he collapsed. A friend of Bishop's mentioned that the entertainer suffered from catalepsy, a condition that often resulted in Bishop losing consciousness for short periods of time. He would probably be alright. Sure enough, Bishop rebounded a short time later and requested to finish the performance. But he once again collapsed. This time he did not recover, was pronounced dead, and shortly after, doctors performed an autopsy. At the funeral parlor when Bishop's wife saw that her husband's brain had been removed, she exclaimed, "They've killed my husband!" According to Mrs. Bishop, her husband had simply been in a cataleptic trance. Normally Bishop carried a note in his breast pocket that stipulated that no autopsy should be performed within 48 hours of supposed death. But no note was found. In an even stranger turn of events, Bishop's mother, Eleanor, wanted to get to the bottom of why an autopsy was performed and who stole her son's brain. So she requested a second autopsy by the coroners. What they found was shocking: Bishop's brain was located in the body's chest cavity -- a strange and eerie end to one of magic's most mysterious characters.